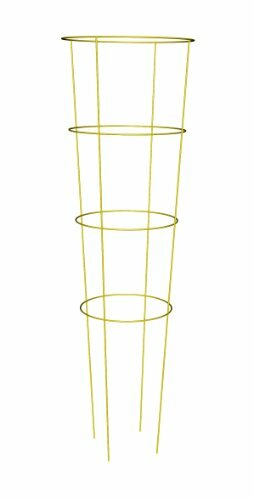 Panacea Tomato Cage with 4 Rings and 4 Legs Yellow 54in This tomato cage is made to support all varieties of tomato plants. It has 4 legs and 4 rings for extra strength. It is 54 inches tall and has a 16" inch top ring to give the plant extra room to grow. It is powder coated YELLOW to give it extra protection from the elements outdoors. It can be used for other types of vegetables and it works well to support flowers also.